Planning a wedding is hard work. From finding the right dress to getting the seating chart just right, there’s plenty of details that can be overlooked. However, one thing many brides focus on is wedding day jewelry. In addition to finding the perfect matching wedding band, most women want the right pair of earrings too. While earrings may seem like a small detail, the right pair can make a huge difference. Although picking the right pair of diamond earrings can seem impossible, it doesn’t have to be a nightmare. Consider these tips when selecting your diamond earrings, and you’ll find the perfect pair in no time! One of the best ways to pick the right pair of earrings is to match them to your ring. For example, if you have a halo setting, then pre set diamond halo earrings make perfect sense. Even if you have a custom designed engagement ring, matching styles is a great option. This simplifies your decisions, and it also allows your jewelry to appear as a set. Additionally, while the diamond earrings may be intended for your wedding day, they can still be worn for other occasions. When selecting diamond earrings, be sure to also match the diamond shape. If your ring is round, you’ll want round diamonds in your earrings whereas a princess cut ring should be paired with princess cut diamond earrings. These round diamond earrings would pair perfectly with a halo engagement setting. One question many brides ask is whether or not to have contrasting metals. The truth is that the decision is up to you. While some engagement rings and wedding bands combine two different metals successfully, this should definitely be the limit. Also, consider what pieces of jewelry are made from which metals. If both your engagement ring and wedding ring are rose gold, then you should probably continue the theme with your diamond earrings. However, white gold earrings are extremely versatile and can be paired with almost anything. Therefore, if you like the look of white gold earrings with a yellow gold ring, then go for it! 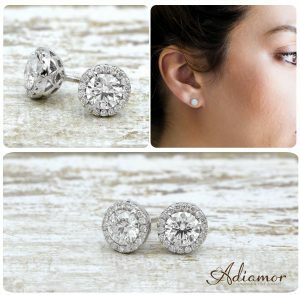 Shop Adiamor’s collection of pre set diamond earrings today!